The mullein has been grown in gardens everywhere since the Middle Ages: it was cultivated by Medieval monks; the Moors planted in their gardens; and it was grown by the Elizabethans. Carried by Odysseus to ward off the sorcery of Circe, the plant now weaves its magic in modern gardens. At recent Chelsea Flower Shows it has been present in almost every garden, its spires providing upright lines in formal settings and sharp punctuation in romantic meadows. Untouched by changes in gardening fashions, the popularity of Verbascum remains constant, and with the introduction of new cultivars it seems likely to maintain its place in the pantheon of good garden plants. Most of the 360 species of Verbascum originate in Turkey and the western part of Asia, enjoying the very well-drained soil and baking conditions. The majority, therefore, are unlikely contenders for a place in the gardens of cold wet Britain. However, an Alpine Garden Society expedition to Greece in 1999 returned with one that appears to be doing well in some British gardens and is now becoming available in specialist nurseries. Verbascum epixanthinum has large rosettes of grey leaves, covered in short silky, golden hairs, making it an impressive sight even before its thick spike of yellow flowers appears. The species most familiar to gardeners is the biennial Verbascum olympicum, the classic mullein: a 2m tall candelabra of branches with clusters of golden yellow flowers. Grown in line against a tall yew hedge they assume the deportment and dignity of the Swiss Guard. Plant them where you want them to flower as the long taproot they produce makes them difficult to transplant. During their first year they form a rosette of grey felted leaves that is not particularly inspiring. A much more attractive juvenile foliage is found on V. olympicum’s cousin, Verbacum bomyciferum. The white rosettes are felted and sturdy, looking like velvet-covered leather. In V. bombyciferum ‘Polarsommer’ they are sparkling white and hairy, making it one of those plants that everyone has to touch. It’s an easy and satisfying plant for children to grow after they’ve moved on from sunflowers. The thick woolly white stems are occasionally branched and take their time in revealing the sulphur yellow flowers. A gardening friend who doesn’t like the harshness of the colour grows the plant for the beauty of its rosette and flower spike, cutting it back at the first peep of yellow. I grow it with the pale blue of Anchusa azurea ‘Opal’, allowing the flower spikes of each plant to dance together while the rosette of the Verbascum hides the untidy bases of the Anchusa. The biennial verbascums produce masses of seed and, left unchecked, can soon colonise parts of the garden. The yellow spires of the European native V. thapsus, familiar on railway embankments and roadway verges, is so prolific a seeder that it is now an invasive weed in parts of North America, smothering indigenous plants. Originally introduced there in the eighteenth century for its medicinal qualities (the leaves, made into a tea, were used by herbalists to treat bronchial problems) it is now an unwelcome guest. In Britain its dried flower-spikes were used as lamp wicks until the introduction of cotton wicks. Dipped in tallow the stems provided torches for Roman soldiers. Until recently the perennial species most often seen in gardens was Verbascum chaixii, the nettle-leaved mullein. Half the height of the large biennials and branching from the bottom, V. chaixii gives a lighter, more delicate, look to the garden, whilst still providing an upright rhythm. Cutting down its flower spikes after they have flowered will produce a second and sometimes third flowering. 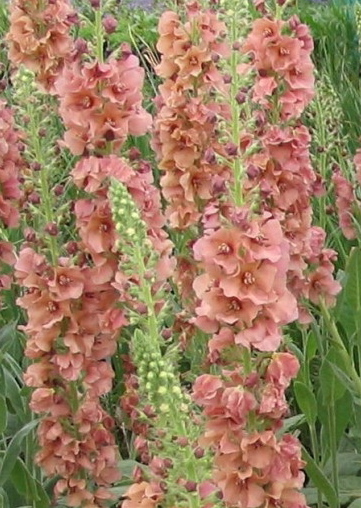 Its robustness and long flowering drew nurserymen to it in the mid-1920’s, when it was used to produce the Cotswold Group of Verbascum cultivars. The group, which includes V. ‘Gaisborough’, V ‘Cotswold Queen’ and V ‘Pink Domino’, embraces a wide colour range, from white through soft pink to salmon, apricot and yellow. Most have violet anthers that give the flowers their distinctive dark eye. Two of the group without this dark centre is V ‘Mont Blanc’, whose chaste whiteness is best appreciated in the garden as the light of a balmy summer’s evening fades, and the pale creamy-yellow of V. ‘Gainsborough’. This is perhaps the most elegant of Verbascums, with large flowers, densely packed along sturdy stems. Floriferous, long-flowering and long-lived it’s all you could wish for in a Verbascum. The plant that re-kindled interest in the genus, Verbascum ‘Helen Johnson’, has become the Grande Dame of Verbascums in the two short decades since she first appeared as a chance seedling at Kew Gardens. The grey felted foliage and large buff copper pink flowers, a colour seldom seen, caused a sensation when it first appeared and has continued to enchant and entice gardeners ever since. Unfortunately the charms of the plant hide a capricious nature: even under ideal conditions it rarely lives more than two years and most plants succumb during their first winter. The plant’s extraordinary popularity has meant that it has been micropropagated by the tens of thousands, resulting in some very inferior plants with small flowers being sold by nurseries and garden centres. A few specialist nurseries still grow the original clone and continue to propagate it vegetatively, so gardeners should still be able to find the original plant: look for large flowers, well spaced on sturdy stems. Spurred on by the popularity of Helen Johnson’s success several nurserymen and plant collectors are introducing new hybrids with tougher and longer-lived parents. Because of the cross-pollinating activity of bees and insects the parentage of these new cultivars is unclear. Their sturdiness probably comes from V. chaixii while some of the darker colours originate from V. phoniceum, a short-lived perennial, never more than 1m high, that has colour strains from soft pink to moody deep purples. One plant breeder has over one thousand new Verbascums. Aware, perhaps, that this is an excessive number for even the most ardent fans of the genus, they are selecting the most eye catching and releasing them to the market slowly. Watch out for lots of new verbascums in the coming years. Verbascums, especially the felted-leaved ones, have a pest that is particular to them. Cucullia verbasci is a small, insignificant brown moth that, itself, does no damage. However, its caterpillar, which emerges in May and June, can destroy a verbascum plant in a day. So seduced was I the first time I saw this beautiful white caterpillar with yellow bands and black markings that I left it on the plant. The next day the Verbascum was completely defoliated, with only a sad stem remaining. Fortunately the moth lays few eggs and, with a beady eye, you should be able to spot the caterpillar and pick it off. It is most common in the south of England and very rare in Wales and the north of Scotland. Occasionally the flower spikes appear to be squashed flat or the tops divided in two. This is the result of fasciation, a condition that even scientists are unable to explain and classify. It appears to be some sort of hormonal imbalance that may be caused by a bacterium, but frost, insects and temperature also play their part. Whatever its cause, fasciation is a botanical oddity and not a symptom of disease. It will not spread to other plants and will not necessarily recur from year to year. However, you should not propagate from plants that have fasciated flower spikes as the progeny may also be subject to fasciation. A sunny place with well-drained, preferably chalky, poor soil is the ideal home for Verbascums. However, they will tolerate a wide range of conditions as long as they are not in either wet or shady places. Verbascum species are easily grown from seed and germinate quickly. The seeds are tiny so cover them with a very thin layer of sifted compost. If you sow them in March or April then do not need to be mollycoddled with heating. Seed of V phoeniceum sown at this time will produce flowers in June and July of the same year. Being sterile, the only way to propagate verbascum hybrids is by taking root cuttings. Traditionally taken in early autumn, they can be done at any time of the year. Simply cut a piece of root, about the thickness of a pencil, into 5cm-long pieces. Lay these in a seed tray and cover with a layer of compost and horticultural grit Label the tray with the name of the variety and water well – do not allow the compost to dry out. New shoots will appear long before the cutting produces any real roots of its own, so do not pot-up your new plants until you are sure that are rooted. Look under your seed tray to see roots appearing at the drainage holes to be absolutely sure that the new plants are ready for re-potting. Grow them on in small pots before planting them out in the garden in the spring.